31 January 2000 The shortage of silver coin during the 18th century, owing to the fact that silver coins were more valuable as bullion; only 3 issues of silver shillings between 1760 and 1800 (1763, 1787 and the Dorrien Magens shilling of 1798, the rarest and most valuable of all); failure of the Government’s 1797 silver coin issue; use of tokens and the Truck Shop system; Dorrien Magens’ and City merchants’ attempt to send £30,000 of silver bullion to be minted into shillings and the Government’s alteration of the law and destruction of almost all the shillings; the solution to the problem by the adoption of the gold standard and the issue of the gold sovereign in 1816. 5 June 2000 Rowland Hill’s reforms to the Post Office and the Act of 1839; Hill’s subsequent problems in reforming the PO until his retirement in 1864. 26 February 2001 The history of the school from its foundation; association with the Mercers explored and explained; role of the school at the forefront of politics and religion, and, at the Reformation, its role in the revival of learning in England; endowment and financial issues. The talk also describes the contribution of each high master to the running of the school. 29 October 2001 A summary history of Fleet Street, encompassing Fleet Marriages (1696-1753) and Sweeney Todd’s barber’s shop, but with a particular focus on the associations of the street with national newspapers. The impact of the introduction of the Koenig Steam Press in 1814, the power of the unions; the role of the Press Barons and the eventual move of the publication of newspapers away from Fleet Street are described in detail. Local Government: the beginning or the end? 18 February 2002 An assessment of ‘British local government, its impact on the people it serves, its potential, its excesses and its failures.’ The talk investigates key changes in local government practice, including the introduction of party politics and various local government reorganisations including those of 1965 and 1986 in London. References to Tony Crossland’s famous phrase ‘The party is over’; the Redcliffe Maud and Widdecombe Enquiries; local authority budgets; Best Value. 17 June 2002 Abridged from a seminar paper, this talk attempts to explain the extraordinary events which led to the burning of the Corporation’s Jubilee Book in 1387. The significance of the book is investigated, an author is tentatively proposed and the contents of the book are suggested. Did it survive in copy form? 16 September 2002 A light hearted assessment of life at Mansion House, with sketches of all the Lord Mayors from Dame Mary Donaldson to Sir Clive Martin. 23 June 2003 Charts the political context in which the Chief Commoner has to operate, together with descriptions of ceremonial and social events in 2002. 6 Oct 2003 Beginnings under the aegis of the Barbican Residents’ Association; changing views about conservation over 30 years; the growth of conservation areas; establishment as a registered charity and the inauguration of the City Heritage Award scheme in 1978; the battle between the Society and Peter Palumbo over the Mansion House Square/No. 1 Poultry site development schemes and the 3 public enquiries associated with them; other schemes opposed or backed by the Society; summary of the Society’s successes and failures over 30 years. 29 March 2004 An assessment of the relationship between Robert Walpole and the City during his Long Ministry: ‘Walpole’s twenty one years in power brought great benefits to the City, but its favourable influence was never readily available to him and its hostility at the end was a factor in his final defeat by his Tory opponents’. 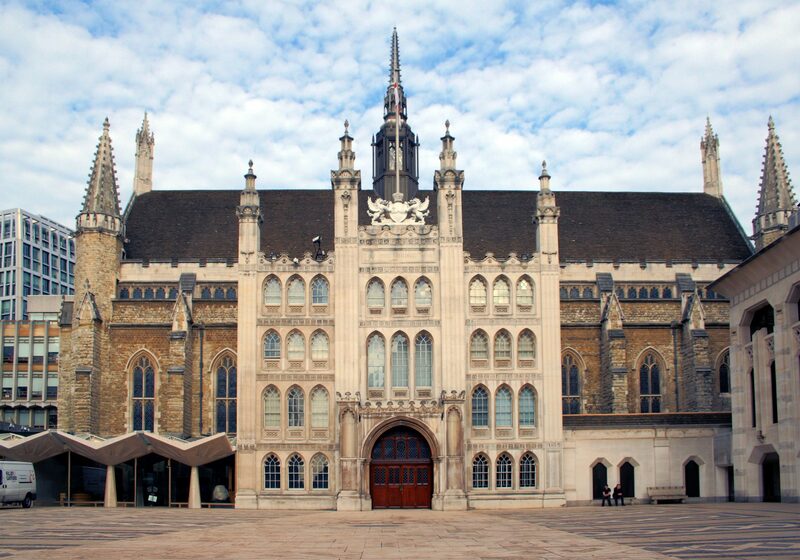 19 November 2004 An account by Richard Gilbert Scott, architect of the scheme, of the tortuous process which led to the rebuilding of the Guildhall Art Gallery. While it received planning permission in 1964 it was opened by Her Majesty the Queen in 1999. 28 February 2005 A history of the Corporation of London Cemetery and Crematorium, designed by William Haywood. The contracts for enclosing the first 98 acres were let in 1854. When the first burials took place in 1856, they were on unconsecrated land, as the consecration of the burial areas could not proceed without untangling the financial arrangement with the 108 parishes of the City. The first cremation took place in 1905. With 200 acres, it is the largest cemetery in London and one of the largest municipal cemeteries in Europe. 24 October 2005 An account of the development of St Paul’s in the early centuries, from 604 to 1300. St Paul’s was a major focal point in the life of the City and a meeting place of the folkmoot, a political and judicial institution which faded away by 1300. 13 February 2006 This paper charts the specific events which make up the relationship between Nelson and the City, from the celebration of three of the four major naval battles in which he took part (and which figure on the Nelson monument in the Great Hall at Guildhall) to his funeral on 9 January 1806. The Rise and Decline of Guilds – with particular reference to the Guilds of Tylers & Bricklayers in Great Britain and Ireland. 19 June 2006 An account of the growth and decline of Guilds from the reign of Henry 1 to the Municipal Corporation Act of 1835 when almost all the guilds in the country were required to surrender the last remaining areas of control they still exerted over trade and industry. The paper uses Tilers and Bricklayers as a specific example, and references are drawn from all over the country. 23 October 2006 The objective of this paper is to reflect the City’s long interest in the Arts by discussing the origins of drama and sacred and secular music in the City. It considers the early histories of the Parish Clerks’ and Musicians’ Companies and the City Waits as well as the Painter Stainers’ Company, — all historical custodians of the Arts in the City. 22 January 2007 This paper described the ceremonies associated with the laying of the first stone of the New London Bridge in 1825. James Sewell, O.B.E., M.A., F.S.A. 15 October 2007 The manufacture of porcelain in London developed with the advent of tea drinking from the seventeenth century onwards. The history of various London factories is examined here, demonstrating the importance of London in the history of English porcelain. Excerpts from a ballad about the damage caused by a bull in a London china shop in 1773 are provided as a conclusion. 11 February 2008 Starting with the first organised pension scheme for Royal Navy Officers in the 1670’s, this paper follows the historical development of pension provision, — from deferred annuities to final salary related schemes and thence to defined contribution schemes. The actuarial reasoning for the shift and its historical context is carefully appraised. While this analysis ranges widely over the management of the City’s estates in the seventeenth century, particular attention is focussed on the period around 1630, when the great series of City Rentals properly begins. The City’s extensive land management experience with both City Lands and d Bridge House Estates is reflected in the growing significance of the City Lands Committee which came into being in 1592. Specific reference is made to the award to the City of the Royal Contract of 1627/28, through which the City Corporation managed to reimburse two earlier royal loans and to obtain a further advance of £120,000. 15 June 2009 This paper reviews the close links between Southwark and the City and the particular significance of the bridge which, from Roman times onwards, has linked the two areas. 26 October 2009 The history of Smithfield Market between 1837 (the date at which it was vividly described by Dickens in Oliver Twist as an overcrowded and poorly managed market) and 1868 (when William Davis’ peaceful and orderly depiction of the market was made). An important step in the resolution of the problem was the Smithfield Removal Act of 1852 which secured the City’s rights to build, at is own expense, run and retain the revenues of any new cattle market even outside the City boundaries.